This question is about the Schlieffen Plan of 1914. Study Sources A, B, C and D and then answer all the questions that follow. (a) Give three statements that could be inferred from Source A about the Belgian defence of Liége. (b) Does Source C support the evidence of Source B about the Battle of Mons? Explain your answer. Use the sources and your own knowledge, to explain whether you agree with this view. 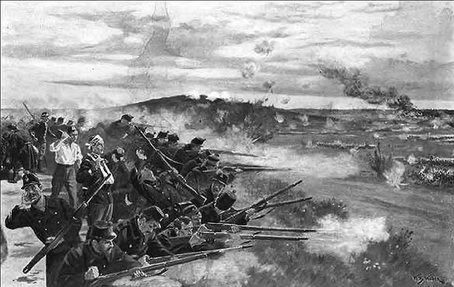 A painting by a British artist in August 1914 showing the Belgian defence of Liége against the advancing German army. "We had no sooner left the edge of the wood than a hail of bullets from the British whistled past our noses. The 160 German troops that left the wood with me were now reduced to 100. From now on matters went from bad to worse. Wherever I looked there were dead or wounded. We were being driven back, badly beaten by the British - by the British we had laughed at a few hours before." From the diary of a German soldier who fought at the Battle of Mons, August 1914. "The battle showed that well-directed fire could mow the enemy down with very little risk to those who were firing. The Germans must have suffered ten times as many casualties as us. The battle also showed that the enemy had no plan of action and did not try to make use of cover. If they had had a proper plan, they would have pushed us back in a quarter of the time they did." From the diary of a British officer in the British Expeditionary Force (BEF) after the Battle of Mons. "Von Moltke, the German commander, made crucial changes to the original plan. The German armies that invaded Belgium were 100,000 soldiers fewer than Schlieffen's original estimates because von Moltke sent additional men to reinforce the Russian front. In addition, German armies were supposed to encircle Paris. This part of the plan was abandoned in early September, leading to the Battle of the Marne." From a history of the First World War, published in 2007.